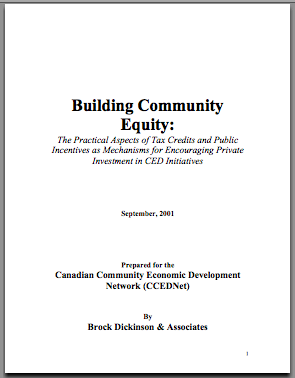 This report responds to one of the five policy recommendations made at the Canadian Community Economic Development Network (CCEDNet) National Policy Forum held in March, 2001. The purpose of the meeting was to create a policy environment to broaden and deepen the impact of community economic development (CED) innovations in Canada. One of the Forum’s key recommendations was to explore a new tax incentive program that would encourage individual and/or private sector provision of equity capital to CED projects. This discussion paper serves to bring some initial clarification to the question of equity financing in a CED context. For CCEDNet to develop future initiatives utilizing equity for CED purposes, it is important to begin by defining the term “equity”. At its most basic, equity represents a capital transaction in which an ownership stake is exchanged for capital. In general, equity investments are riskier than other kinds of investments. As a result, equity investors will seek to make investments in those companies likely to generate the largest returns on investment in order to offset a higher degree of risk. From a CED perspective, this poses problems since equity investment has not been evenly distributed within the population. Rather, it has tended to gravitate towards a narrow group within the larger population, denying capital to those outside the established power structure. Over time, this has a tendency to focus investments and capital in certain areas, and to potentially encourage investors to look away from smaller centres when they place equity investments. However, it should also be pointed out that equity investments have two distinct advantages from a CED perspective. First, they provide an avenue for very early funding of new ventures and initiatives - funding that would not otherwise be available through debt. Second, they can help to keep capital (money) in smaller communities if and when equity investment opportunities can be found those smaller, often disenfranchised communities. One example of such opportunities is referred to as Community Economic Development Investment Funds (CEDIFs), which are programs designed to facilitate millions of dollars of equity investments in disenfranchised communities for CED purposes. More specifically, a CEDIF is a pool of money raised by individuals, groups and businesses for investment in a community. Although traditional economic relationships and large institutional players have prevented the benefits of equity from accruing to all entrepreneurs and communities equally, this does not suggest that equity in and of itself is flawed. Rather, equity can be a powerful tool for local empowerment and economic growth, building opportunity and community capacity. To achieve this, however, CED practitioners must utilize tools and models (like CEDIFs) that bypass the inherent weaknesses and faults of the established financial power structure, in order to facilitate the flow of capital from those who hold it, to those who can make use of it at the community level. A tax credit is essentially an agreement between a government and a taxpayer to reduce the amount of taxes to be paid in exchange for an expenditure or investment in an arena where the government seeks to increase such investment. Tax credits are useful from a variety of perspectives. For government, it is a way of encouraging investment in a field where government resources may not be sufficient to meet goals and objectives. For corporations, tax credits may make certain activities affordable (e.g. Research and Development). For individuals, tax credits are a way of reducing personal income tax costs. In the CED context, this has led to the introduction of tax credits for those who make equity investments in Community Economic Development Investment Funds (CEDIFs). The underlying rationale is that while CED is good for the community, government resources alone may be insufficient (or inappropriate) for certain kinds of CED investment. The combination of CEDIFs and tax credits is thus a mechanism to encourage investment in CED by rewarding those who make equity capital available with a tax credit. An example of a CEDIF program is the Equity Tax Credit program established in Nova Scotia in 1993, which allows for provincial tax credits of 30% to residents that invest in Nova Scotia small businesses. The credit allows equity investment in corporations, co-operatives and community economic development initiatives. Thus, the program provides an avenue for individuals and community groups to raise capital for local investment purposes. A different type of tax credit program is New Hampshire’s Community Development Investment Program (CDIP), which is the major funding program for community development projects in that state. The CDIP enables New Hampshire’s businesses to donate funds or property, in lump sum payments or pledged over a predetermined period, to fund economic development and housing projects throughout the state. Contributions made by businesses entitle them to a 75% state tax credit. Most provinces and territories offer a variety of tax credit programs linked to equity investments and, to a lesser extent, CED investments. The most common of these is a tax credit for funds invested in labour-sponsored venture capital funds. Such credits can be found in Nova Scotia, New Brunswick, Quebec, Ontario, Manitoba, Saskatchewan and the Yukon. British Columbia offers a similar venture capital tax credit. Aside from tax credit programs, there are a number of distinct provincial and federal business assistance programs targeting rural and disenfranchised communities. It is clear that equity investment provides significant opportunities for CED initiatives. The experience of New Hampshire and Nova Scotia, among others, shows that equity investing for CED purposes can be effective. While still a relatively new concept, equity investing for CED has led to the creation of a variety of CEDIFs across North America and Europe, and opportunity exists for more to be created. However, there are practical issues related to equity investing for CED purposes that need to be overcome. These issues include regulatory obstacles that differ in each province and territory. Rates of return, investor appeal, exit routes, and operating costs associated with CEDIFs and other equity investments also present practical obstacles that must be addressed. Governments across North America and around the world have come to recognize the value of investments in CED initiatives. They have also come to realize that these investments require encouragement through incentives. One avenue for doing this is through tax credits. Other incentives are possible, including tax deductions, investment guarantees, foreign investment allowances, and rate of return guarantees. While tax deductions and investment guarantees have been employed in limited circumstances, foreign investment allowances and rate of return guarantees have never before been proposed for CED investments. CCEDNet should undertake an initiative to move gradually toward the introduction of a national equity investment strategy, culminating in the creation of a widely-available CED equity investment fund. The process for achieving this goal has five essential steps. To date, equity investment programs for CED in Canada have been coordinated at the provincial level, and have been largely based on the use of provincial tax credits. The development of a national strategy or program will therefore require close coordination between provincial interests. Although a federal program may be a possibility down the road, it will be easier in the short term to work within the existing framework, rather than attempting to create a new one. A number of problems were outlined relating to the distribution of equity financing. As a result, it may be worthwhile to consider the establishment of a range of specialized national CEDIFs targeting disadvantaged or disenfranchised groups within the larger population. The use of an investment pool or fund seems the most viable option for a successful equity investment strategy. It provides economies of scale by investing in multiple projects, can be marketed to a wider variety of investors, allows for greater discretion in selecting target investments, and provides some legitimate possibility of exit routes for investors. Rather than establishing a national pool immediately, however, it will be important to demonstrate the viability of such an approach to equity investing for CED. The development of a smaller-scale, regional pool as a demonstration or pilot project allows fine-tuning of protocols and activities, and can help to leverage the buy-in of more reluctant partners. The final step is to create a national model based on the results of earlier research and of the regional pilot project. At the heart of the national program would be the creation of a CEDIF, a targeted investment pool designed to enhance local CED initiatives. In the end, such a venture represents a significant undertaking, and has major ramifications for the organization assuming the lead role. However, it seems likely that if the necessary research can be completed, and the appropriate relationships can be built, significant new resources will be available to disenfranchised groups and communities across Canada. Although the task is daunting, the opportunity exists to make literally millions of new dollars available for renewing and revitalizing communities across Canada.